We’ve all accidentally saved over a crucial file and lost something important, and that’s exactly what the Versions feature of Mac OS X aims to prevent by providing a history of a documents life. Modern versions of OS X with the Versions feature have improved dramatically, and it’s now easier to use and more logical than ever. The date and time of the last save will be shown, allowing you to easily confirm that’s the file variation you are looking for. You can still browse through the entire revision history of a given document by going to “Browse All Versions” instead, but the last saved version of a file is the most commonly used and having that as an option makes a lot of sense. 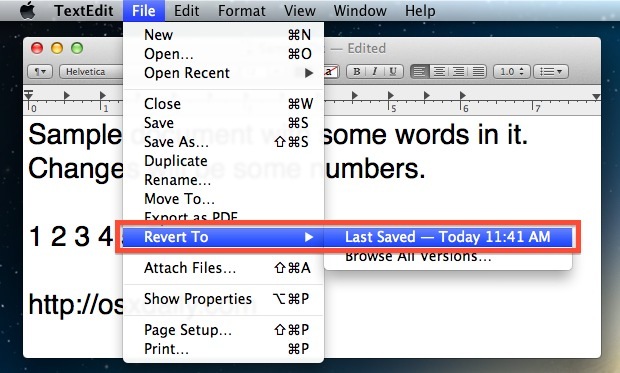 Jumping back to the last saved version even works if you have auto-saving turned off upon document closing, just don’t forget to save at some point otherwise your last version may not be the one you’re looking for. This works in all modern versions of OS X, so it shouldn’t matter what’s running on the Mac as long as it’s somewhat new. Awesome, you can really pick any date it was ever saved. There even is a freaking timeline! This just saved me a LOOOT of time, THANKS!! i accidentally restored an old version of a numbers document, and i lost about 12 hours of work by doing so. can i undo the restore? because now the undo button is grey, i can’t go back to the “new” version that i forgot to save. please help me!!! Thank you, thank you, thank you!! This just saved me from a real headache!! !